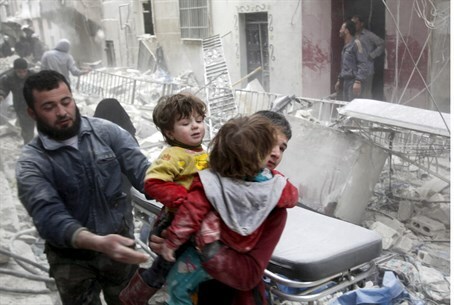 British foreign secretary condemns Assad regime's 'indiscriminate killing' after roughly 100 killed in two raids. Regime air strikes killed at least 20 civilians in a rebel-dominated area of northwestern Syria, a monitor said Sunday after raids elsewhere in the country left more than 70 dead. "The regime's planes have committed another massacre, this time in Jabal al-Zawiya," a mountainous region in the province of Idlib, the Syrian Observatory for Human Rights said of the Saturday bombing. "Many wounded are in critical condition," said the Britain-based group, which relies on a network of sources on the ground. The raids came on the same day that barrel bombs dropped by President Bashar al-Assad's helicopters killed more than 70 civilians, including children, in the northern province of Aleppo. Those strikes, which targeted a market in the jihadist-controlled town of Al-Bab as well as a rebel-held neighborhood in Aleppo city, prompted an international outcry. "This is further shocking proof of the horrific and indiscriminate methods the Assad regime is using to kill and injure innocent civilians, including children," said British Foreign Secretary Philip Hammond. "Our position remains as strong as ever -- we will continue to call for a political transition to a future in which Assad has no part," he said. Regime barrel bombs - crude weapons made of containers packed with explosives - have often struck schools, hospitals, and markets in Syria. But Saturday's death toll was among the highest.